So I finally convinced my husband that a yurt is the way to go BUT he feels we need a basement because he does not trust the yurt on it's own. So I am wondering if anyone has any experience with building a full or partial basement and putting the yurt on that?? I suggested a large root cellar, in case of hurricane? We live between Albany and Vermont, so severe weather really isn't a problem. BUT if this is the hurdle I need to clear to realize the dream, I guess I'll start looking into it. My goal was to keep the yurt minimal and off-the-grid and very economical. But his goal was to live in a conventional house. So I need to compromise, as this will be our full-time, long-range home. Re: Yurt over a basement? Regarding economics, it is 100% certain building a dug out basement with conventional floor system atop it is going to cost some real money. If you were thinking round foundation, well they are extremely rare. In fact I've never seen one. If you go the rectangular basement route, and place a round yurt atop it, then you have to have an even MORE expensive membrane deck to protect the basement. Membrane decks are pricey. If you build a root cellar within the footprint of the yurt, you'll need to leave the stair access area clear of belongings. Frankly if I was considering a small home, as your husband might be thinking, I'd build a conventional two bedroom 28x32 rectangular rancher on top of a full basement. We have good friends that did exactly that and ended up with four children in that home. Do some of the work yourselves, and finish the basement as funds allow. You could consider the unfinished basement the root cellar. For real economy and to get on with things, a simple yurt on a wood deck- go with that. Don't worry. You could later pour a 12x16 slab on grade and build a shed with loft on it for a long term low maintenace dwelling that won't leak or fail in the worst storm. Then if a hurricane comes blowing through, we can hide in the root cellar. (Or drive to my uncle's conventional home with full basement, 30 minutes away). But the yurts are engineered for 100MPH+ winds. I doubt we will ever see winds like that up here. I just need to convince the husband of that! be anchored well to the site because the weight of the yurt itself will not hold the platform down. Our latest engineering (to the 2012 IBC ASCE 7-10) rates our yurts at 142 mph, but this won't do any good if your platform doesn't stay put. Last edited by Pacific Yurts; 08-20-2014 at 12:18 PM. The 'labor intensive' part, anything an oddball head scratcher, is $$$ to $$$$, depending on tradesmen in your area. Going with simple is $. Doing it yourself is $. Listening to Lowes and Home Depot seminars makes people with limited skill get the idea tradesmen aren't worth the money. They try it, and it isn't uncommon that $ turns into $$ or $$$. 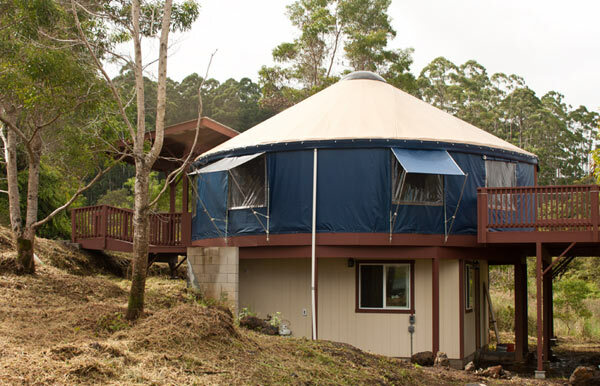 There are plenty of examples out there of "2 story yurts" Showing that you can place a yurt on top of a more traditional foundation. Something you might consider to placate your husband is many yurt companies offer real windows, and you can add tongue and groove wood to the interior to give it a more solid feel. Or there are plenty of companies that do offer solid "yurts" with solid panel walls rather than canvas, which might also placate the husband. I would agree with others than having a basement would add to the costs of a yurt significantly. Making it less of a cost saver doing a yurt. However a happy marriage is priceless. So finding a way to placate your husband can be important. One way you might mitigate initial costs could be to build a yurt on a raised deck platform, like the 2nd picture. With the idea that you can add on the basement level after the fact. This would give your husband time to maybe get used to the yurt without a basement, and give you time between first investment of yurt and platform and building the basement. Of course one big thing would be the land your planning to build on and what sort of building it allows dictated by terrain etc. Bob Rowlands and klhandler like this. Now that's a very nice comment about cosidering your spouse. Good post. However a happy marriage is priceless. So finding a way to placate your husband can be important.